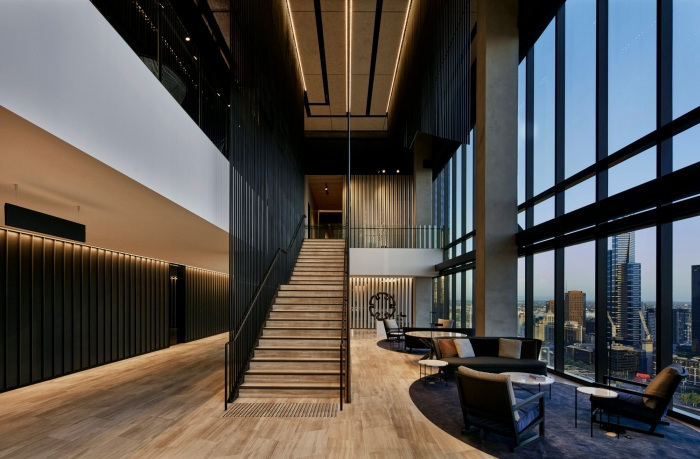 Bates Smart Architects designed the offices for law firm Corrs Chambers Westgarth, located in Melbourne Australia. The Corrs Chambers Westgarth Melbourne premises carry strong references to the context of the city. ‘Urban laneways’ are used to frame areas and generate a sophisticated client floor on level 25. This is linked to other levels with a dramatic and sculptural stair to level 26 containing the staff and client cafe. The expansive void strikes a balance between polished and deconstructed interior elements, with dramatic ceiling heights, exposed architectural elements and a mixture of hard and soft materials to reference the vibrancy of Melbourne’s laneways and vibrant hospitality sector. Warm, natural and timeless materials promote a sense of honesty and reflect an international image. Continuity of architectural features from the base building is reflected in the interior providing a strong interior/exterior link.